It was a 'no-bull' arrest that would have made a Wild West deputy proud – as traffic cops in Hampshire lasso a bull that strayed on to a motorway with a towrope! > The errant brown bull had wandered onto a busy stretch of the county's road network and presented traffic police with a rather tricky problem. Chief inspector of roads policing for Hampshire and Thames Valley, Andrew Bottomley, took to Twitter yesterday to explain his officers' rather unusual predicament. On the social media website he said: "Interesting chat with Sergeant @hantspolroads after report of cattle on the motorway and plan of capture." "Plan A climb into back of car through open car window lasso bull walking on hard shoulder with a tow rope." But the officers' plan soon presented them with a rather sticky situation – if successful, they would have a bull - which can weigh around 700kg - attached to their police car. 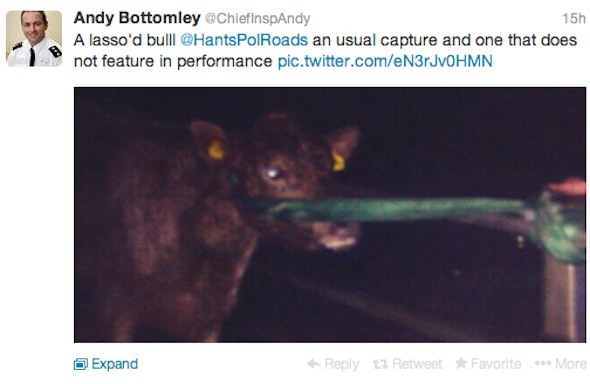 As the picture above, tweeted by the chief inspector shows, the officers' Wild West skills were clearly successful as the bull is shown being pulled along behind the car. Chief Inspector Bottomley joked on the social media site that unfortunately the arrest wouldn't "feature in performance" statistics for his department. It is believed the bull was led to safety by the traffic cops before being returned to its owner. It's also unclear how the beast managed to get on the motorway. 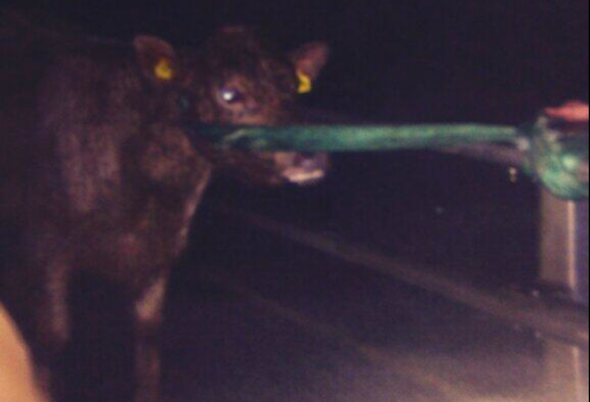 AOL Cars has contacted Hampshire Police and will bring you more information on the cattle case when we have it.